Penn Battle II is the Best Spinning Reel for Stripers. 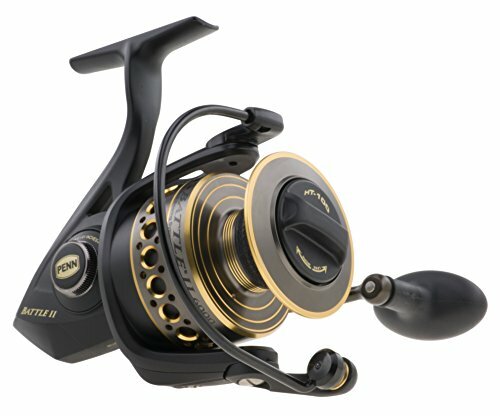 Penn Battle II 4000 is a mid-range reel with high-range features such as proprietary HT-100 drag system and redesigned ball bearings. You’ll soon find this reel is your favorite piece of fishing gear. Penn Battle II 4000 offers fantastic overall value. Penn Battle reels have been popular with saltwater anglers for many years. Battle II series, released in September 2014, is the successor to the original model. The Penn Battle II has set the bar high for the mid-range spinning reels. It is considered to be one of the best striper fishing spinning reels in the world, dollar for dollar. In this review will cover the Penn Battle II 4000. The 4000 model Penn Battle II is a tremendous reel and has great overall specs. It has a full aluminum body and an aluminum side plate and rotor but only weighs a 12.8 oz. In addition, it comes with 5+1 upgraded ball bearings, a superline spool, line capacity rings, and an Infinite Anti-Reverse bearing. The Penn Battle II 4000 can handle up to 165 yards of 12lb mono or 185 yards of 30lb braid. The capacity is perfect for catching big or small fish. As you unbox your new Battle II you’ll find the packaging is well designed. The packaging is just large enough to house the reel and the crank. There is also some cardboard shock padding, and bubble wrap for protection. The crank installs on either side and is very easy to change out. Simply unscrew the crank and switch the cap from one size to the other. Overall it is a pleasure to fish with the Penn Battle II. It has a super smooth operation and the instant Infinite Anti-Reverse ball bearing gives a solid hook set on larger fish by eliminating extra play in the handle. The Battle II has proven to be very popular with striped bass anglers. It is a reliable reel that performs consistently no matter where you cast your line. It’s also common to find spinners work better in windy environments than baitcasters. And, the Battle II is one of the best spinners on the market. Penn’s famous HT-100 Drag system is included on the 4000 model of this reel. Made of carbon fiber fabric that’s laminated on fiberglass, it provides 15 pounds of drag and the system is designed to dissipate heat in the drag sack. Greased with Penn Blue Lube, this drag system is far more durable than other carbon or felt washers. Penn has created newly keyed drag washers in the Battle II. This new keying process allows Penn to use both sides of the washer. As a result, the upgraded HT-100 provides 20% more drag than the Penn Battle original model. All of this means the Battle II is perfect for fish that go on a quick run. You are able to let the HT-100 Drag system wear down the fish so their runs will become successively shorter and less violent. Or you can stop a fish that is running for cover by turning up the drag. That mechanical advantage will give you an edge, especially if you are fighting a large striper or if you are an inexperienced angler. You also get an edge from the 6.2:1 gear ratio on the 4000 model. It gives you over six spins for every one turn of the handle—or 37 inches of the line– providing you the power you need to pull in any large fish at the tail end of the fight. The larger models of Battle II can even handle Sailfish or dolphin. Another great feature of this reel is the newly designed ball bearings. These new bearings are fully sealed and designed to stop the saltwater intrusion. On other reels, saltwater tends to get inside the ball bearings and crystalizes when it drys — which causes roughness as well as corrosion. If you’ve ever heard a crunching sound and felt any vibration when turning the crank on your old saltwater reel, you’re familiar with poorly designed ball bearings. These new bearings will reduce maintenance on your reel and keep you fishing longer. And the high-quality design of the Battle II doesn’t stop there. Most reels have a bearing for the line roller and the reel handle. This can be a nice feature, but it requires you to service your reel more often. Penn decided to use a bushing instead. The bushing keeps out water and fish grime better than a bearing, without any loss of performance in the rod. It’s a simple, easy adjustment that reduced the manufacturing cost of the Battle II so it would remain a mid-range reel but did not reduce its performance on the water. Something you’ll find very useful is the line capacity rings. The Battle II has rings marked at one third and two-thirds capacity. First, it makes spooling the line much easier – you’ll know how much line you need to add at a glance. Secondly, you will eventually find yourself fighting a big fish and need to know how much line you have before he spools you. Instead of taking your eyes off the line too long while trying to guess and possibly losing the fish, you can take a quick look at the line capacity rings and see if you are under a third or not. And as you reel in the line, you’ll be able to estimate how close you are to pulling in the striper. Penn has created an awesome bail trip mechanism that reduces miscast and helps offer protection if you drop reels on rocks or sand. In fact, the entire reel has a high quality feel to it. Even the plastic drag cap with infinite clicks pings enough to be heard in a semi-loud environment. Penn has taken the time to design and craft the Battle II in an all-aluminum body with an all-aluminum spool and used anti-corrosive paint to ensure you have a low maintenance reel that is just plain fun to fish with. It can survive an accidental dunking or banging on rocks without a problem. It can serve you well for decades and you may find yourself passing it down to the next generation of family anglers. But if you buy the wrong size, Battle II 4000 is a very popular reel that tends to hold its resale value. The Penn Battle II is painted black with gold accents, making it a very pretty reel. Penn has created a wonderful design that is highly functional while remaining attractive. There is something about the black and gold color scheme that feels elegant and powerful, just like the fish we are angling. This really is the perfect reel for anglers of any skill level. You’ll be surfcasting striped bass and bluefish before you know it, and having the Penn name and quality behind your new reel will give you the confidence to use it over and over again. 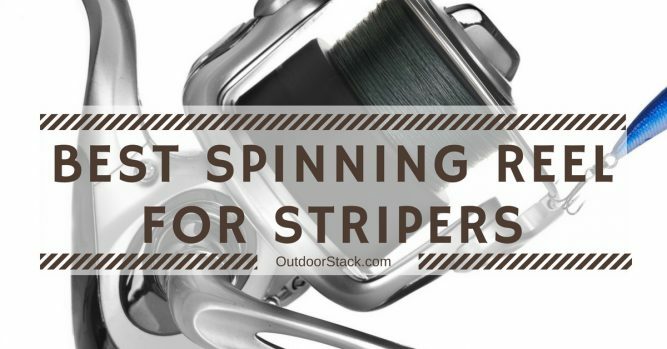 We hope you like our pick of the Best Spinning Reel for Stripers. If you would like to suggest any other spinning reel for striped bass then please tell us via the comments section. We will try to include it in our next update.